Among the variety of options we offer for empowering other members of your team to interact with your AppInsights dashboards / data, perhaps the most important is inviting them to access your AppInsights account directly. Not only does this allow you to delegate the maintenance of certain dashboards to relevant colleagues, but it also encourages further interaction and investigation of the data therein. Read below for information on how to get started with adding users and driving collaboration within our app. For “view & edit” or “view only” users, an added level of security allows you to limit access to specific dashboards, or even specific authentications. This is perfect for a company owner or team manager who may be interested in sharing only specific kinds of dashboard data with corresponding stakeholders or functional heads. For example, a sales manager may only have the ability to view data that is being surfaced via Salesforce data streams, or a customer support rep can only view Zendesk KPIs. These are just a few examples of the flexibility you’ll have using our user management panel. 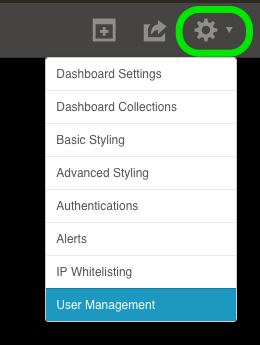 To get started, navigate to the primary AppInsights settings menu -- gear icon at top right -- and select the “User Management” menu. Adding users will require you to send invites to each colleague you want to invite, so make sure you have their email addresses handy! For full instructions, check out our user management tutorial. Once multiple users have access to your AppInsights dashboards, it’s only a matter of time before questions and commentary around your KPIs begin to emerge. Our “Collaboration” feature was created with this in mind, and empowers users to initiate dialogue within AppInsights by adding comments to specific widgets. These comments can be made by, and are visible to, all users on your account with ownership privileges. All comment history is also saved so you can catch up on recent AppInsights conversations you might have missed. For more information on adding comments to your AppInsights widgets, check out our collaboration view tutorial.